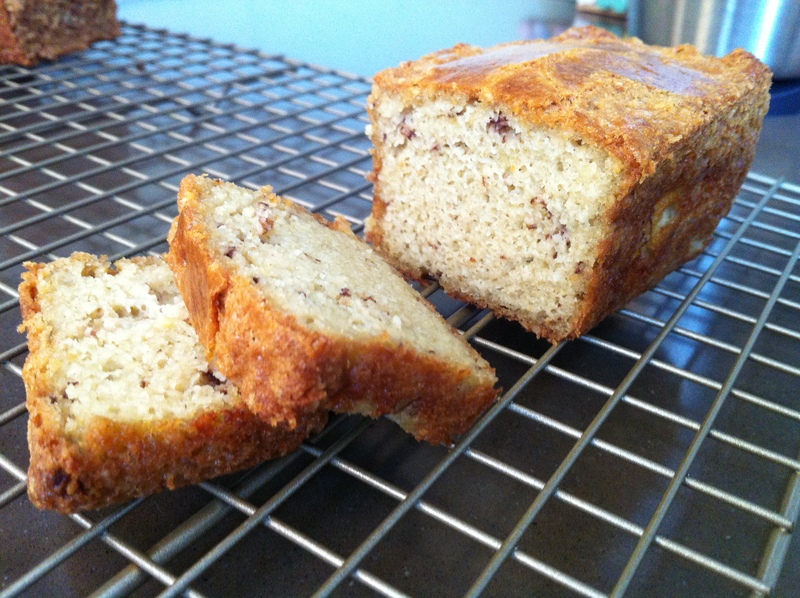 Clara saw her sister eating banana bread and requested hers to be exactly the same as her sisters’… so i had to make this with a little bit of banana but couldn’t use too much of it like a regular banana bread because of the carb. If your diet allows, add more banana and omit the syrup. Mix all the wet ingredients together. Mix all the dry ingredients well and add to the wet mixture. Add mashed banana. Butter the pan and pour the batter in. Bake for 20-25 minutes. If you’re making these as mini muffins, bake for 15 minutes. To make the ratio 3:1, increase the butter to 41g, or serve 2:1 recipe with butter cream frosting. I have used this as a base for other recipes. It is very good. Same base add blueberries and make muffins. I have added apples and raisins to make another type of bread. It is all very good. Thank you so much. I am a beginner in cooking and eating this way. It sure helps when you want something sweet. Thank you. How long do I cook if I make a regular sized loaf? Also, do I just double the recipe above? A full size loaf usually takes between 45 min and 1 hour. The pan Tiffany used was very small, I think you would need to quadruple the amounts listed here for a full size loaf pan. Okay, I cooked it a little longer and it was perfect! Thanks for your help! When I make this, it’s always really oily at the bottom. Am I not cooking it long enough or can I use coconut oil in place of some of the butter? I am not a great cook, so it’s impossible for me to figure some of these things out. I haven’t run into the same problem yet. maybe try baking it for another 5-10 minutes? since every oven is different, you might want to try that. also, make sure your butter in softened at room temperature, not melted. you should definitely play around with the recipe to find what is perfect for you. try the coconut oil, that might be helpful. I made this for Aidan and he is loving it for lunches! He has been refusing his proteins at school and this doesn’t even feel like a protein. Thanks so much. I am going to try a pumpkin bread this way next. it is always great to hear that kids enjoy these recipes. i have a recipe for pumpkin muffins, which i can post another day. if you are using pumpkin puree, add little bit of ground cloves and ground nutmeg to complement the pumpkin taste. How many mini muffins would make a serving? this whole batch makes 2 servings (one serving is 3.7g of carb), so if you yield 6 mini muffins, 3 of them will be one serving… each muffin should be 1.2g of carb. The carb is high due to banana, so if you don’t use fresh banana at all and only use banana flavor DaVinci Syrup, the carb will be significantly lower (2.3g per serving), and ratio will be around 2.5:1.